SM General Santos is bringing the film which gave the Philippine Team an extended standing ovation at the 2016 Cannes Film Festival to the Generals for a 1-Day screening. Watch out as Ma' Rosa hits SM Gensan Cinema's big screens (Cinema 1 & 2) on Dec. 7th. 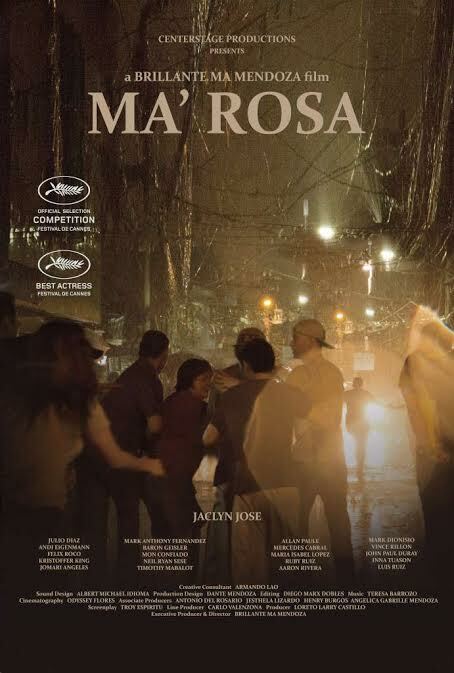 A film directed by Brillante Mendoza, Ma' Rosa was selected to compete at the Cannes, winning the Best Actress trophy for the lead, Jaclyn Jose. In the film, Jose plays a mom who sells prohibited drugs with her husband Nestor, played by Julio Diaz.Their fate changes when their neighbor sets them up for a police raid leading to their arrest. "The idea of this film came up four years ago when I became indirectly involved with the said incident. It captures my interest to tell this story because it shows a unique but also disturbing characteristic of a common Filipino family. That when a family member is backed against the wall for the wrong doings that he or she made, you will do everything to keep them out of trouble even if it means violating basic virtuous. In a society where survival of the fittest is a fact that we have to live with, family becomes amoral." Ma' Rosa also casts Baron Geisler , Jomari Angeles, Neil Ryan Sese, Mercedes Cabral, Andi Eigenmann, Mark Anthony Fernandez, Felix Roco, Mon Confiado and Maria Isabel Lopez. The Gensan Screening on December 7 will be preceded by a media launch at the SM Event Center (Dec. 6) at 5:00 in the afternoon, with the film director himself, Mr. Brillante Mendoza. Screening tickets for Ma'Rosa sell at P150. For group bookings and ticket reservations, please visit the SM Cinema Office and look for Mr. Marc Mabilog.